EagleVail’s Mikaela Shiffrin edged out Slovakia’s Petra Vlhova by four-hundredths of a second in the final leg of a World Cup parallel slalom event on Wednesday in Courchevel, France — the 35th victory of the 22-year-old’s meteoric career. Following Tuesday’s win in giant slalom, Shiffrin now has four victories so far this season, including a slalom at Killington and a downhill at Lake Louise. The defending Olympic slalom champion and three-time world champion in slalom — including at Beaver Creek in 2015 — battled long and hard in the round-robin style format Wednesday night. Wednesday’s knockout round format was similar to the nations’ team event held at the world championships. That format will make its Olympic debut at Pyeongchang, South Korea, where the Winter Olympics will be held Feb. 9-25. It’s unclear if Shiffrin will compete in the nations’ team event given that she will be among the favorites now in slalom, GS and combined. One day after winning the giant slalom in Courchevel, France, Mikaela Shiffrin took her second FIS Ski World Cup victory in two days—this time in the parallel slalom. 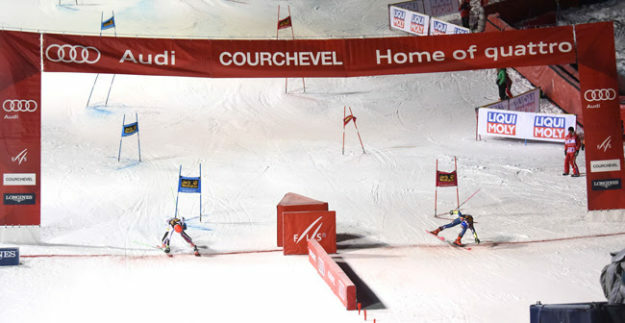 Under the lights in a head-to-head format, Shiffrin picked off skier after skier—starting with France’s Coralie Frasse Somet in the 1/16 round, moving on to Austria’s Carmen Thalmann in the round of 16 and beating Austria’s Ricarda Haaser in the quarterfinals. She then raced Irene Curtoni of Italy in the semis before facing off against Slovakia’s Petra Vlhova, who beat Shiffrin in the season-opening slalom in Levi, Finland. The two 22-year-olds were neck-and-neck, but Shiffrin was able to squeak through the lights just before Vlhova—winning by .04 seconds. This was Shiffrin’s 35th World Cup win and her third win in a row. Curtoni was third.